Scandinavian Interior Design – When it comes to interior designing, Scandinavian offers functionality and aesthetics in a perfect balance. According to Ikea’s Communication and Interior Design Manager Craig Ritche, the character or any Scandinavian interior design involves three key factors: functionality, simplicity, and beauty. Functionality is always the most important. What is the point of having something beautiful on the outside when it serves no purpose at all? Simplicity spares you the hassle of matching things up. If an object is functional but not user-friendly, then it will not do any good either. Not many people have the same amount of patience to learn to use something that is too complicated for them. It is also not just the patience, but time and energy. There is no good result if it is not done from the heart. After functionality and simplicity, comes the beauty. Yes, it still matters. It is a good thing if you have some things at home that function well. It is even better if they are also simple and easy to use. If you do not have enough artistic flair, simplicity means being free from having to match things up. This type of design can help you to decide. Without beauty, functional and simple stuff will not attract many people. Since we are talking about interior designing, surely you would prefer having things that are also nice to look at. If you have those three key factors in things at home, then all is set. You get to experience a nice, homely feel daily at your place. Coming home feels like expecting your own personal paradise. This is what Scandinavian interior design represents. It is a mixture of Sweden, Norway, Denmark, and Finland. With this style, you receive a space full of light, heavily utilizing natural elements, clean lines, and neutral colour palettes. You will not have too much trouble mixing and matching elements in every piece of furniture with the surroundings. hoose this for your home environment and imagine how much time and energy that you can save. The origin of Scandinavian interior design is from Nordic cultures. Nordic countries are well-known for long winters, lack of daylight, and small houses. These things cause their need for something bright, airy, and cozy homes. This does not mean that there is only one typical Scandinavian style when it comes to home interior designing. However, there are some distinctive traits that you will easily recognize as the typical Scandi style. 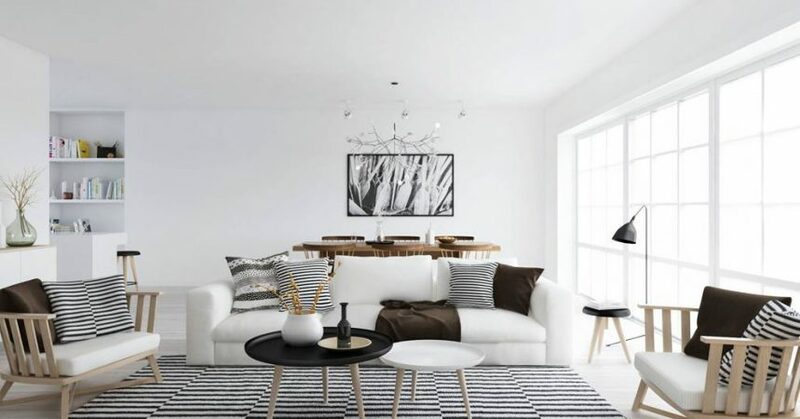 As long as the designing involves clear, grey lines and neutral colours, you get yourself a Scandinavian style at home. Other elements include unfinished wood pieces and fur rugs. Scandinavian interior design started becoming popular in 1947. It was the time when a well-known design exhibition in Milan, Italy, took place. The exhibition was called Triennale di Milano, which showcased furniture and home accessories from the Nordic countries. The exhibition gained positive feedback, recognition, and acceptance. From there, the Design in Scandinavian show went to US and Canada from 1954 until 1957. The popularity of Scandinavian interior design grew in the 1990’s. More designers started creating bold, functional, and unique pieces inspired by it. According to Skandium Co-founder Christina Schmidt, this type of design had been on the radar in the UK for a while. From architects, designers, aficionados, until the general public, it started getting noticed more. It is no longer a surprise that the UK homes have been heavily influenced by Scandinavian interior design. But what about those who live in tropical areas? Will it be suitable for them too? Will it give the same effect? No worries. In fact, this type of interior design helps to reduce the heat at home and save you from having to decide the right furniture. As mentioned earlier, neutral colours work for almost all kinds of other colours. There are many Scandinavian interior design examples that also work well with tropical houses. Besides below ideas, you may try the other ideas to suit your needs for a nice, cozy home environment. So, what are you waiting for? If you still have not got any idea for your Scandinavian interior design at home, check these samples out. 1 1. A lovely kitchen that is white as snow, wherever your gaze goes. 2 2. A simple bathroom with white tiles and grey outlines. 3 3. The elegant grey does not always mean it is gloomy. 4 4. A Nordic-style home with nice, wooden palette floor. 5 5. A classic studio with the furniture, textiles, and plants on the side of the room, leaving a decent space in the center. 6 6. A dark-grey, built-in kitchen cabinet for a post-modern look. 7 7. A classic Scandinavian style meets modern design: a fireplace that is next to a wall of book shelves. 1. A lovely kitchen that is white as snow, wherever your gaze goes. 2. A simple bathroom with white tiles and grey outlines. 3. The elegant grey does not always mean it is gloomy. 4. A Nordic-style home with nice, wooden palette floor. 5. A classic studio with the furniture, textiles, and plants on the side of the room, leaving a decent space in the center. 6. A dark-grey, built-in kitchen cabinet for a post-modern look. 7. A classic Scandinavian style meets modern design: a fireplace that is next to a wall of book shelves.